Jet Air was established in 1969 in Clintonville, Wisconsin and in 1970 became an authorized Mitsubishi MU-2 Service Center. In the 70’s Jet Air also was a Service Center for the Fairchild SA226 and SA227 aircraft. In 1980, Jet Air relocated to Green Bay, Wisconsin to support the new Mitsubishi MU-300, now known as the Beechjet 400, with a new maintenance facility. In the early 80’s, Jet Air became a full line Service Center for Piper aircraft as well as a Honeywell TPE331 series engine Major Service Center supporting the various engine models associated with the MU-2, Turbo Commanders, Merlins, Cessna Conquest, and Beechcraft B100 aircraft. Along with the Honeywell engines, Jet Air also became affiliated with Dallas Airmotive and Standard Aero, supporting the Pratt & Whitney PT6 and JT15 engines for the Beechcraft King Air, Piper Cheyenne, MU-300, Beechjet, and Cessna Citation. We implemented our accessory shop, which included starter generator overhauls along with cleaning and flowing of the TPE331 and PT6 engine fuel nozzles. We established a full line avionics shop with all the major product lines. As avionics advanced, we continued to add-on the new products to our capability list. In 1984, Jet Air purchased an existing fixed base operator (FBO), then known as Jet Air Fuel Corp. In the late 80’s, Jet Air established a calibration laboratory and continued to expand with the industry’s needs. In 2003, Jet Air was purchased by a group of local businessmen. The Part 135 charter department was implemented, then known as Frontline Aviation, operating Beech King Airs and Piper twins. We became a Cirrus Authorized Service Center for the SR20 and SR22 series aircraft. A new state-of-the-art facility was constructed to house the entire company’s operations: a full-service FBO, aircraft maintenance, avionics, air charter, flight training, and calibration. With the consolidation, the company name was changed to Jet Air Group. Jet Air Group became a partner with Lakeland College, providing flight training for Lakeland’s four-year aviation minor program in Sheboygan, Wisconsin. Jet Air Group received the Growth Business of the Year award from the Green Bay Area Chamber of Commerce. Jet Air Group added a CATS computerized FAA testing center and an FAA-approved flight simulator to its Green Bay flight school location. FAA approval was granted for private pilot and instrument rating Part 141 programs. The Wisconsin Aviation Trades Association named Jet Air Group 2012 Wisconsin Aviation Business of the Year. In November, Jet Air Group became a Signature Select Fixed Base Operator (FBO) to further enhance our services. In the summer of 2013, Jet Air Group hosted the 2013 MU-2 Owner/Operator Fly-In prior to EAA AirVenture. It was an educational and fun-filled event. Jet Air Group received FAA approval for a part 141 commercial pilot training course. In October 2013, Jet Air Group broke ground for a new 30,000+ square-foot hangar facility adjacent to the existing facility in Green Bay. In August, Jet Air Group became a factory-authorized Enstrom Helicopter Service Center. In September, Jet Air’s new addition, a 36,000 square foot hangar facility opened. With over 80,000 square feet of total hangar space, Jet Air Group became the largest FBO on the field, with the most heated hangar space. An aircraft interior shop moved in to the new facility. A ramp expansion was completed along with an additional taxiway connecting to taxiway “delta,” allowing for more parking space and easier turn-around. Our avionics shop grew from one full-time technician to four. Jet Air Group was awarded the US Military contract. In September, Jet Air’s newest hangar was finalized, a 40,000 square foot hangar facility opened. 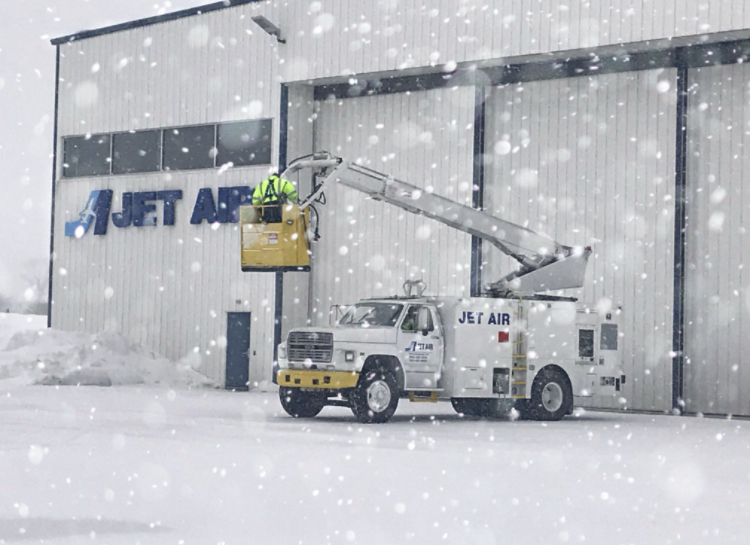 We now have 120,000 square feet of total hangar space; Jet Air Group is by far the largest FBO on the field, with the most heated hangar space. An aircraft interior shop moved in to the new facility. A ramp expansion was completed along with an additional taxiway connecting to taxiway “delta,” allowing for more parking space and easier turn-around. 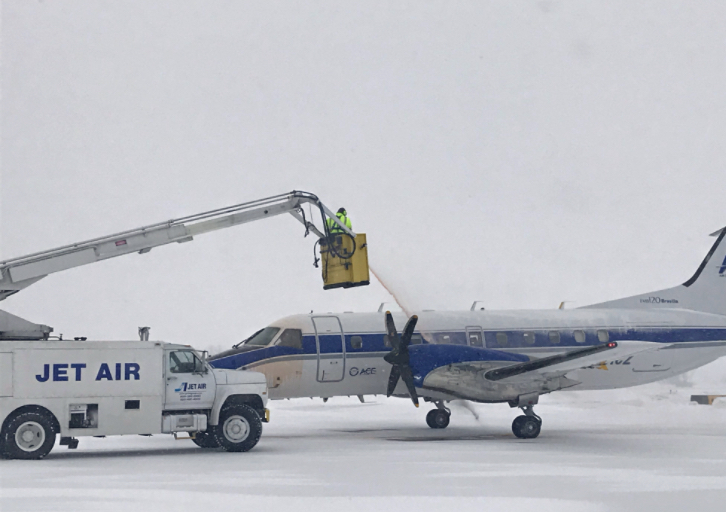 In January, Jet Air purchased their own de-ice truck. From 1969 to the present, we have been continuously striving to improve our services for the aviation community. As the aviation industry advances, so will Jet Air Group.